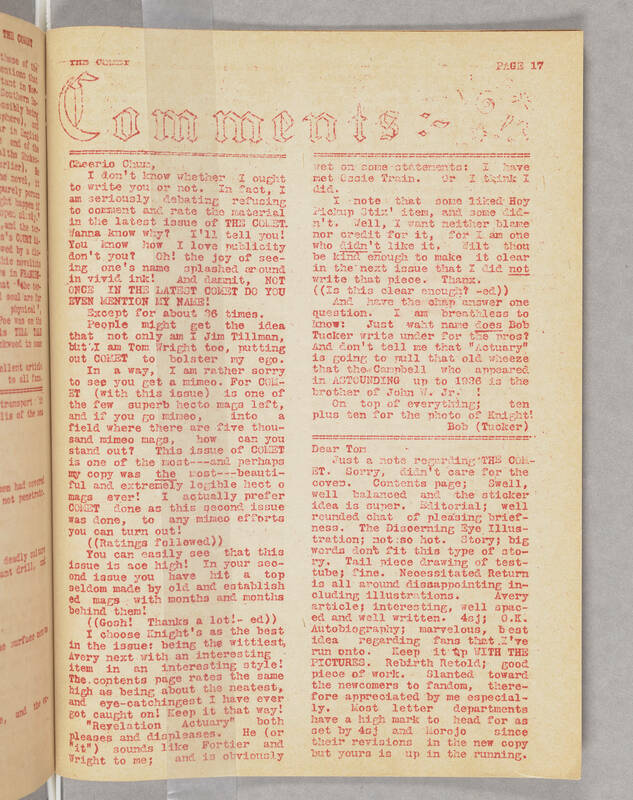 THE COMET PAGE 17 COMMENTS: Cheerio Chum, I don't know whether I ought to write you or not. In fact, I am seriously debating refusing to comment and rate the material in the latest issue of THE COMET. Wanna know why? I'll tell you! You know how I love publicity don't you? Oh! the joy of seeing one's name splashed around in vivid ink! And damnit, NOT ONCE IN THE LATEST COMET DO YOU EVEN MENTION MY NAME! Except for about 36 times. People might get the idea that not only am I Jim Tillman, but I am Tom Wright too, putting out COMET to bolster my ego. In a way, I am rather sorry to see you get a mimeo. For COMET (with this issue) is one of the few superb hecto mags left, and if you go mimeo, into a field where there are five thousand mimeo mags, how can you stand out? This issue of COMET is one of the most---and perhaps my copy was [[underline]]the[[end underline]] most---beautiful and extremely legible hect o mags ever! I actually prefer COMET done as this second issue was done, to any mimeo efforts you can turn out! ((Ratings followed)) You can easily see that this issue is ace high! In your second issue you have hit a top seldom made by old and established mags with months and months behind them! ((Gosh! Thanks a lot!- ed)) I choose Knight's as the best in the issue: being the wittiest, Avery next with an interesting item in an interesting style! The contents page rates the same high as being about the neatest, and eye-catchingest I have ever got caught on! Keep it that way! "Revelation Actuary" both pleases and displeases. He (or "it") sounds like Fortier and Wright to me; and is obviously wet on some statements: I have met Ossie Train. Or I think I did. I note that some liked Hoy Pickup Stix' item, and some didn't. Well, I want neither blame nor credit for it, for I am one who [[underline]]didn't[[end underline]] like it. Wilt thou be kind enough to make it clear in the next issue that I did [[underline]]not[[end underline]] write that piece. Thanx. ((Is this clear enough? -ed)) And have the chap answer one question. I am breathless to know: Just waht name [[underline]]does[[end underline]] Bob Tucker write under for the pros? And don't tell me that "Actuary" is going to pull that old wheeze that the Campbell who appeared in ASTOUNDING up to 1936 is the brother of John W. Jr. ! On top of everything; ten plus ten for the photo of Knight! Bob (Tucker) Dear Tom Just a note regarding THE COMET. Sorry, didn't care for the cover. Contents page; Swell, well balanced and the sticker idea is super. Editorial; well rounded chat of pleasing briefness. The Discerning Eye Illustration; not so hot. Story; big words don't fit this type of story. Tail piece drawing of test-tube; fine. Necessitated Return is all around dissappointing including illustrations. Avery article; interesting, well spaced and well written. 4sj; O.K. Autobiography; marvelous, best idea regarding fans that I've run into. Keep it up WITH THE PICTURES. Rebirth Retold; good piece of work. Slanted toward the newcomers to fandom, therefore appreciated by me especially. Most letter departments have a high mark t head for as set by 4sj and Morojo since their revisions in the new copy but yours is up in the running.